Cécile Chaminade, pianist and composer, was born on August 8, 1857 in Paris, France and died on April 18, 1944 in Monte Carlo. She wrote her first composition at age 8 and performed her first concert at age 18. Chaminade composed a wide variety of works, including an Opera, Ballet, several Suites for Orchestra, a Concert Piece for Piano & Orchestra and several Piano Trios. 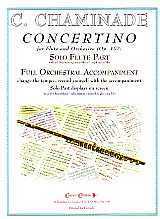 Concertino for Flute and Orchestra (Op. 107) was composed in 1902.